For several decades I’ve found useful research conducted at Ben-Gurion University in Israel. The main campus is in Be’er Seva where Dr. David Shinar runs a research lab devoted to driver safety. Be’re Seva (Beersheba) is significant to three of the world’s major religions as the home of the prophet Abraham 4,000 years ago. But from even earlier it had long been a cross-roads for the spread of knowledge. It has only been a university town for 45 years. Dr. Shinar happens to be a graduate of Hebrew University from where I first gleaned research confirming that advertising is impotent as a tool for changing image because, unlike publicity, ads which now have an overall negative ROI, have the effect of equally entrenching both positive and negative views. But Shinar’s expertise (beginning with a Ph.D. from Ohio State University) is at the nexus of both industrial engineering (human factors engineering or ergonomics) and behavioral phycology. Now he has produced ground-breaking research about the effect of roadside billboards on safety. Interestingly, he didn’t come at it from the usual, “how long were they glanced at” approach. 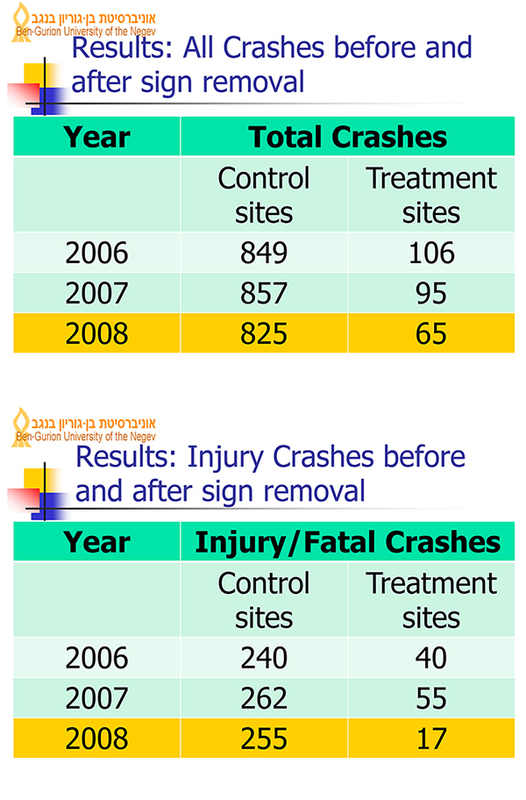 Thanks to a Supreme Court ruling that removed billboards from the freeway that dissects the Gush Dan/Tel Aviv area, Dr. Shinar was able to compare accidents rates over three years both before and after using 8 sites where billboards were removed compared to six other control sites. He studied both the number of investigated crashes overall and those resulting in significant injuries and/or fatalities. He also controlled for traffic volume. An opportunity like this is very rare, similar to a ten year period where the value of tourism marketing was studied when the state of Colorado dismantled their state tourism office and “went dark” while other states continued promotion. It isn’t as easy to study the impact of billboards are you might think. This is because they are viewed for only a few seconds—half as long as they take to discern—and because even fleeting or subliminal glances can have lethal consequences when billboards are placed in areas where optimum concentration is required on the roadway. Dr. Shinar is an expert on overall driver capacity and when spare capacity is available. Little is available along city streets or urban highway corridors where “the gap between driver expectation and reality” is razor thin. This is why crashes happen so often on freeway exits, where North Carolina lawmakers recently made it legal for out-of-state billboard companies to mow down trees so they could be more distracting. No science was behind that move, only a few whiners with misleading information falling on sympathetic ears, deaf to any other information, especially anything scientific. This myopia to the consequences of billboards over the years has been bipartisan in nature, correlated to campaign contributions as much as whining special interests. Israel is also not a place where scenic preservation, conservation and character are often at issue. They are central to North Carolina’s brand and quality of place. North Carolina would be better off without any billboards, but especially in urban areas. Durham banned them just as I came here twenty five years ago to jumpstart the community’s official marketing agency.